The Neugebauer House is located in Naples, Florida, in the luxurious residential area of Fort Charles Dr. Overlooking the Doubloon Bay, this house was designed on a wedge-shaped site with amazing views of the water and palm trees that dominate the landscape. It was designed in 1995 and construction completed in 1998. It is a piece of the vintage architecture we cherish today with a sublime touch from Richard Meier’s Neo-Corbusian philosophies of design. Borrowing a lot from Le Corbusier’s forms and shapes, Richard Meier and Partners went ahead to design what has now been termed by many as an architectural classic. The plain geometry, light, color and emphasis on the principles of design helped the architects to come up with a building whose every aspect interacts and integrates well with one another. Standing on its site at the time and even today, the Neugebauer house exudes uniqueness because it is just totally different. However, it still feels like there would never have been a better site to design and construct this building on. The building’s longest axis spans the full-width of the wedge-shaped plot overlooking the waterfront. The open area in front of the building acts as a courtyard, and with a cylindrical two-car garage designed and built in this area, 25 palm trees have been planted and arranged to form a square-like orchard to screen the garage and provide better views to people passing by in front of the house. The garage features Spanish limestone finish all around its façade. Immediately after the courtyard, the horizontal façade was clad in limestone slabs that were reinforced with a strong concrete frame and masonry structure to conceal the water on the other side. 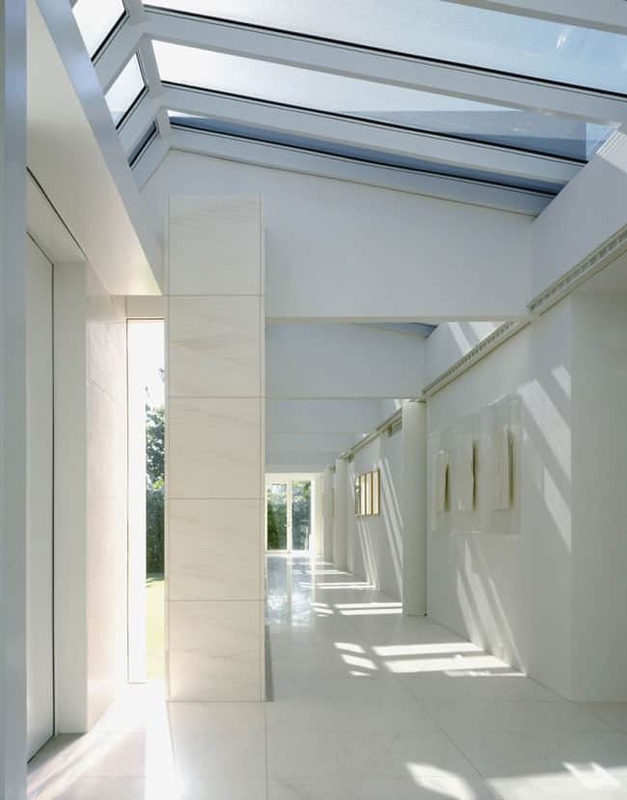 The façade also hides a corridor that stretches the full length of the house while being lit from the top by rectangular windows slotted in at the top of the façade. 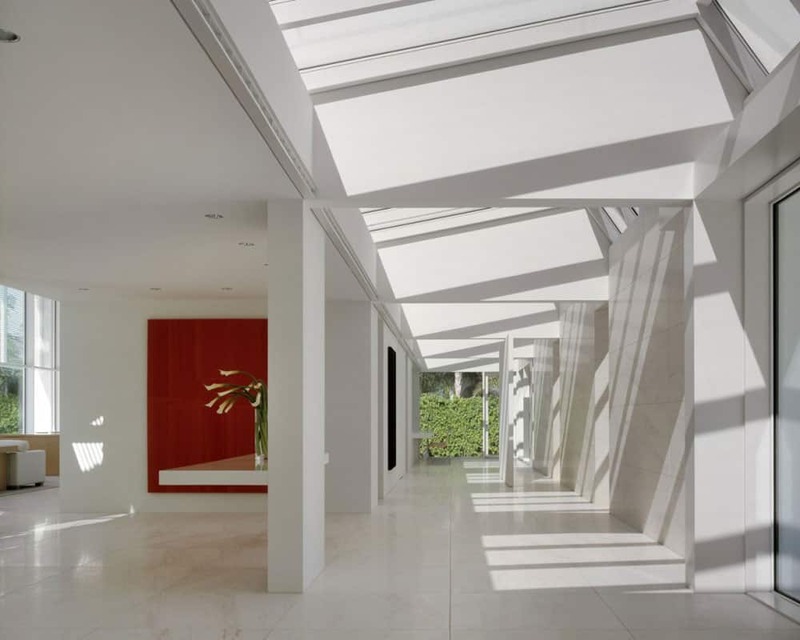 The architects designed the house to have linearly organized functions beginning from the entrance, to the service which is the long corridor, to the living space, followed by the sun terrace and a rectangular lap pool marking the end of that development. Following the linear formation of the whole development, all the major spaces including the living spaces and the sleeping areas have been accorded interesting views to the lap pool and even further to the bay yonder. The living spaces including the kitchen and the bathrooms are covered by a butterfly-like roof which is supported by steel frames below it as it cantilevers further into space. The roof is the component of this house that squarely depicts the vision of the architect, an almost daring but safe design that manages to remain as interesting as it could possibly be. 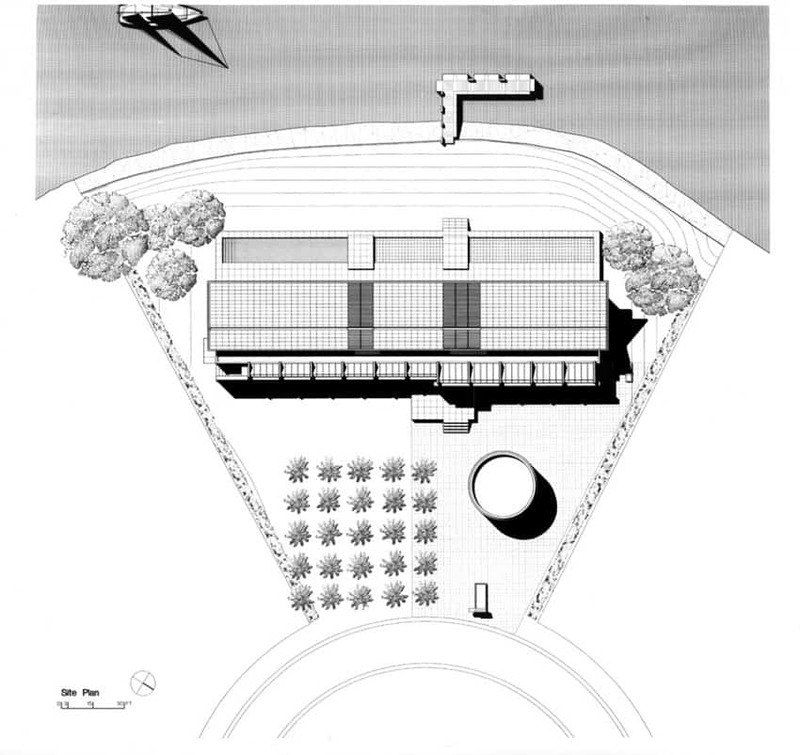 The local design code required that roofs must be pitched and the inverted roof on the Neugebauer house was the architect’s clever way to meet that requirement while at the same time emphasizing the orientation of the house towards the water. The façade overlooking the pool is designed from a special type of glass with the capability to act as a sun shading element for the immediate spaces. 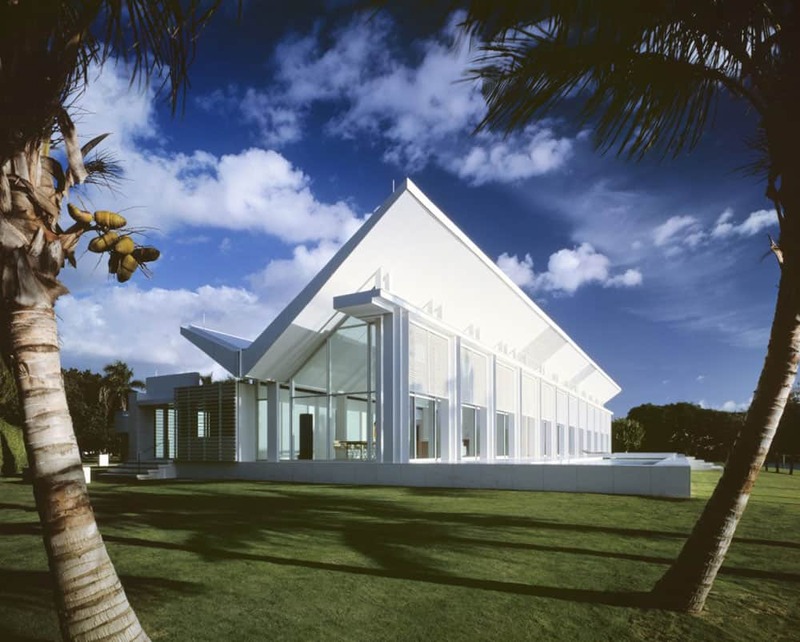 The curtain walls are hurricane resistant and made from thick laminated glass to protect the house and its occupants in case of a hurricane hitting the Doubloon Bay. Previous Story Previous post: Fondation Louis Vuitton: Frank Gehry’s Most Audacious Act Yet!